As we all know, it is mandatory to comply with Companies Act, 2013 from financial year 2015-16. To comply with an Act, is not only to comply with its sections and their provisions but also with the schedules included therein. 2.Deal with AS6 and Schedule II of Companies Act, 2013. 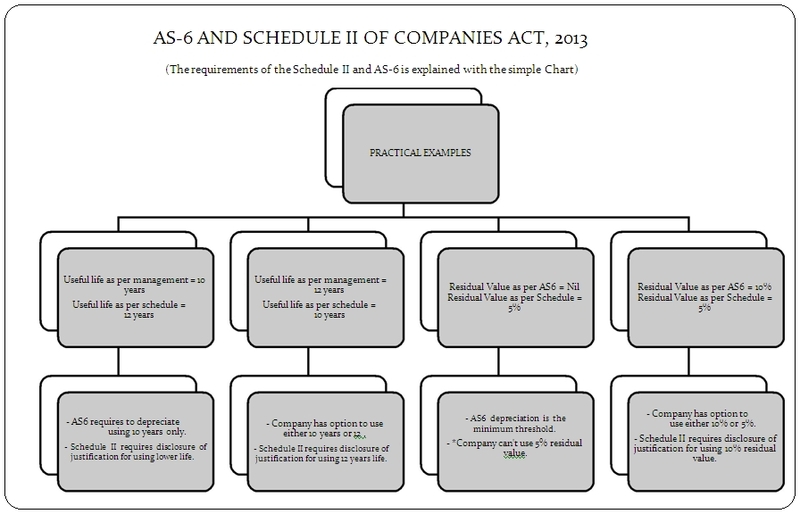 Understanding of provisions of AS6 and Schedule II. Practical understanding of Transitional provisions. As per Schedule II, the depreciation to be charged on the basis of the useful life of Asset, unlike the earlier Companies Act, where the rate of depreciation was prescribed instead of the useful life. This Schedule II prescribe the useful life of the Asset and further states that the useful life of an asset shall not ordinarily be different from the useful life specified in the schedule and the residual value of an asset shall not be more than 5% of the original cost (Gross Block) of the asset. Provided that where a company adopts a useful life different from what is specified in the schedule or uses a residual value different from the limit specified above, the financial statements shall disclose such difference and provide justification in this behalf duly supported by technical evidence. *In addition, Schedule II requires disclosure of justification only in case residual value exceeds 5% of the cost (Gross Block). 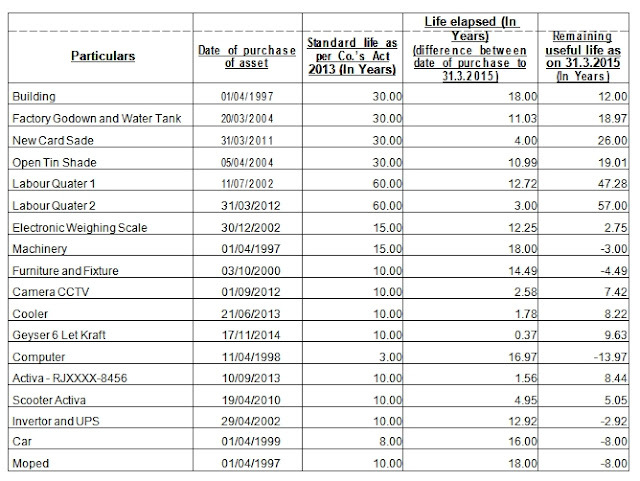 As AS-6 states where the management’s estimates of the useful life of an asset of the enterprise is shorter than that envisaged under the provisions of the relevant statue, the depreciation provision is appropriately computed by applying a higher rate, if the management estimate of the useful life of the Asset is longer than that envisaged by the statue can be applied only in accordance with the requirements of the statue. Fixed Asset Chart as per Old Companies Act for the year ended 31st March, 2015. 1.Bifurcate the block into individual assets it contains. In our e.g. Building consists Factory buildings (General Building, Factory Godown, Card Shade, Tin Shade), RCC Buildings (Labor Quarter 1, Labor Quarter 2). Vehicles consist Motor Cycle, Cars (other than those used in a business of running them on hire), and *Moped having residual value less than 5% i.e. 0%. 2.Now, go as back as you can in your records and find out the purchase date and amount of these individual assets. Take 5% of that Gross amount (with additions) at 1st April, 2016 as Residual Value. 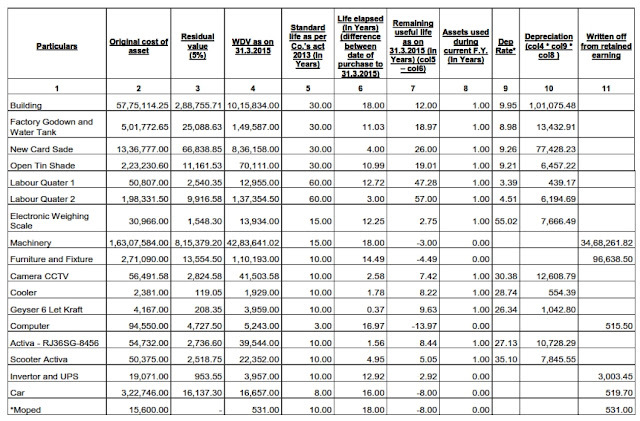 3.Figure out the useful life of individual assets from Part C of Schedule II to Companies Act, 2013 and then compare that life’s with actual lives spent by the asset. Where, n = Remaining useful life of the asset. R.V = Residual Value as at the end of useful life of the asset. 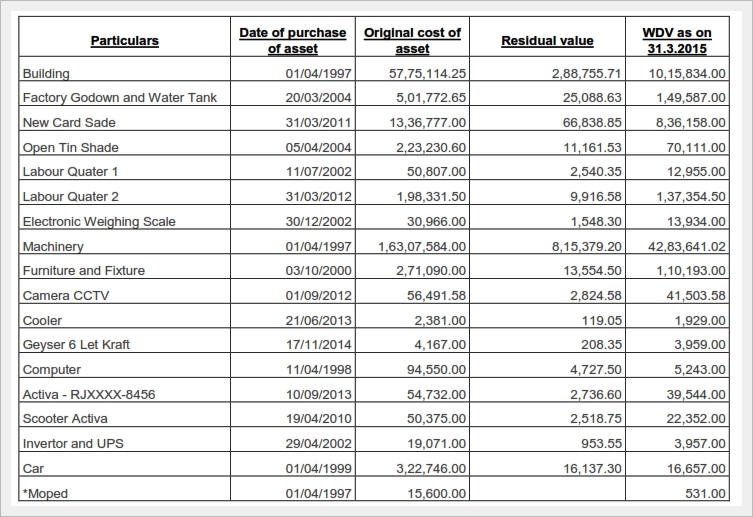 W.D.V = Written Down Value of the asset. a) First divide R.V. (2,736.60) with the W.D.V (39,544.00) and press =; you will get (0.06920). b) Press √ (under root) sign 12 times; you will get (0.99934). c) Press – and then 1 (Subtract 1) then ÷ and 8.44 (Remaining life) then + and 1 (Add 1). d) Continuously, press × and = 12 times; you will get (.72880). e) As per formula, subtract 1 from .72880; you will get (-.27119), multiply it with 100.
f) Here is your depreciation rate = 27.12%. 5.Finally, compute the depreciation for the year on the opening W.D.V (carrying amount) of the asset, which has remaining useful life, at the rate of depreciation calculated as above. 6.Where the remaining useful of an asset is NIL (or comes in minus), the carrying amount of such an asset, after retaining the residual value, may be recognized in the opening balance of retained earnings or may be charged off to Statement of Profit and Loss. Note 1:- The above application is fairly simple if the company uses straight line method (SLM) of depreciation and the asset will be depreciated equally over the new remaining useful life of the asset determined as per schedule II. Note 2:- If the company opts to adjust the carrying amount of the assets to the retained earnings in accordance with the transitional provisions of the Schedule II, the tax effect of the same has to be also adjusted directly against the retained earnings in accordance with the ICAI announcement “Tax effect of expenses/income adjusted directly against the reserves and or Securities Premium Account”. Note 3:- If there is any addition made in the form of new asset in any block of asset, it will be treated as an individual asset and depreciated over its useful life as per Schedule II at rate of depreciation calculated under the method employed. Any deduction or sale of asset will be reduced or removed from the block and depreciation will be calculated over the remaining carrying amount of the asset.